I have the late summer but not yet fall blahs. 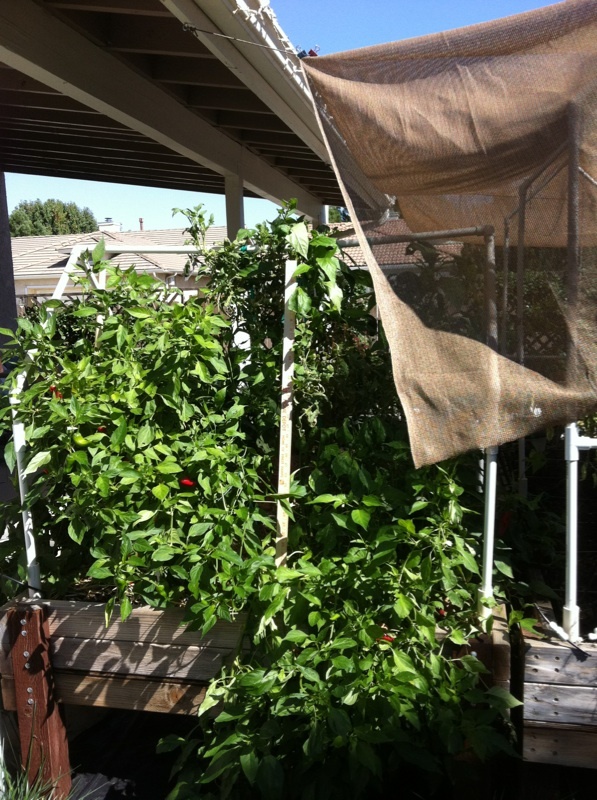 I still have some producing bean vines, peppers and 4 tomato plants I want to remove so I can seed for winter greens and snow peas. Maybe in 2 weeks. Garlic for sure later. I can't work outside with the smoke so I spent some time building a balsa wood SFG for teaching. Maybe give it a try. Like I said, just the blahs. I'm going with Ken to Pismo tomorrow. He wants to ride the dunes and I can just nap or walk around while he does. Maybe go on one run with him before dinner. Seafood!! Need to put up some of my patty pan this weekend, blanch and freeze. Supposed to cool off so I can do this inside. Right now, off to work, after watering my seeds...hope they come up! This morning I checked the garden. I must be a Real Gardener now because I have had a dose of every local "insect" pest this summer. The lovely late KY wonder bean stalks have scale. I tore out the scaly Rattlesnakes in prep for snow peas so they must have slowly crawled over to the KY W. lol I still have 2 wasps around the pepper TT. 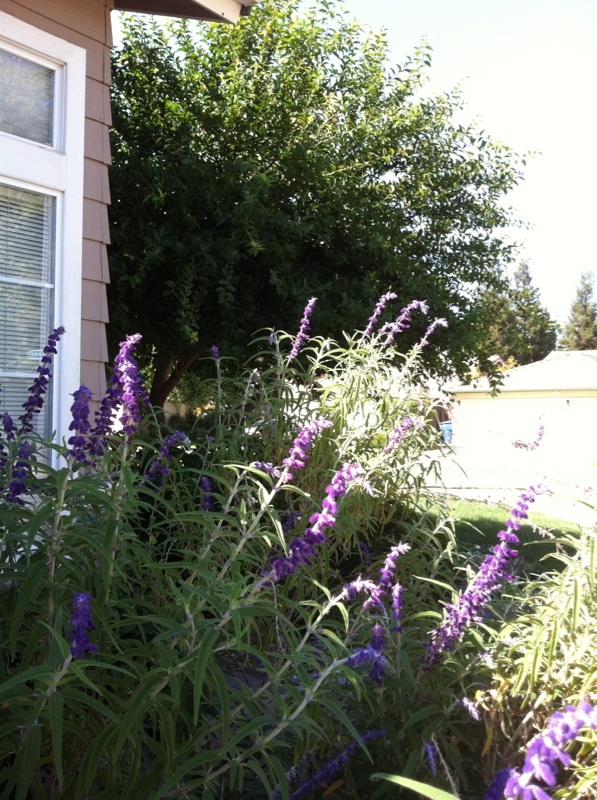 The bees are loving the whatchamacallit in the front yard. A few Argentine ants in some of the boxes. 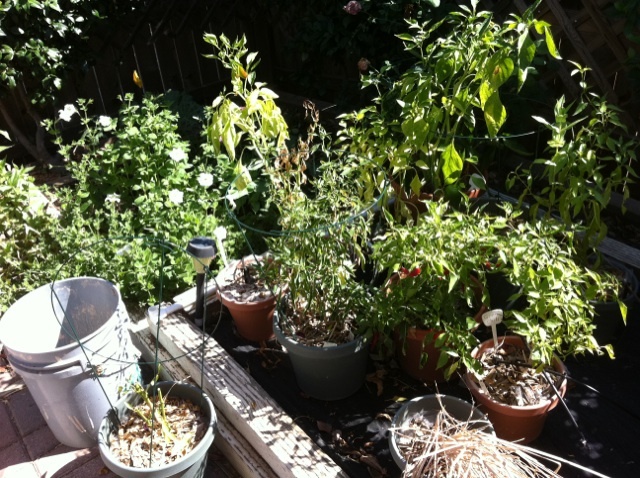 White butterflies, green grasshoppers, PM, various tomato ailments. Leaf-footed bugs. Yep, I'm a real gardener now. The air is down into the yellow zone but it's still in the high 90's. I really, really need to sow the winter garden soon. We aren't going to NY - Maine this October, but instead, touring the SW desert / mountains by car for 5-7 days. Now that I know I can use the laptop in the car (where ever there is service ) I can check in now and then. You know, post out of focus photos. What are Hawaii folks planting and harvesting? Thanks Sanderson. Always wanted to know the name of that plant. Whatchamacallit!! Soooooo.... hubby is at a church men's retreat in the mountains (coming home today) and I decided to get to work on the fall/winter garden even though it's still probably high 90s. I refused to look at the temps or I knew I wouldn't go out there, LOL! I harvested one bed of potatoes and sweet potatoes - so so harvest. They're in a bed that gets shaded all the late afternoon by my green house so I wasn't certain how well they would do anyway. Then I cleaned up and planted about 70 sq ft plus or minus of seeds. I didn't write a thing down (again, I'm so bad!) but there is Swiss Chard, spinach, two rows of lettuce, turnips, carrots, beets, and peas. I've probably forgotten something. Other than the usual aches and pains, it felt so good to be out there getting things ready. Wow, Audrey! You were busy! Rosina, The pink celosia WMCI. Some were was over 4' high today and the bees have been abandoning them, so out they came today along with the Peter Pan agapanthus. The agapanthus are several years old and a stubborn grass keeps coming up among them. I have some homemade compost to add for this color spot and then it will be replanted with snapdragons and pansies for winter. Sanderson, I thought you all were in a terrible drought. Looks pretty green to me. Must take a lot of work. When we were on restrictions we could not water outside so we bought a 300 gal. tank and hauled water 18 miles round trip to keep our trees alive, no garden that year. John, You're right, it does look pretty green for August. The lawn is watered two 5-min bursts twice a week = 20 min. I sprayed it with compost tea and with milk/molasses this summer. Plus Neem recently because of the fungus that is killing Fescue grass in this area. I'm trying to slowly convert husband to natural stuff. 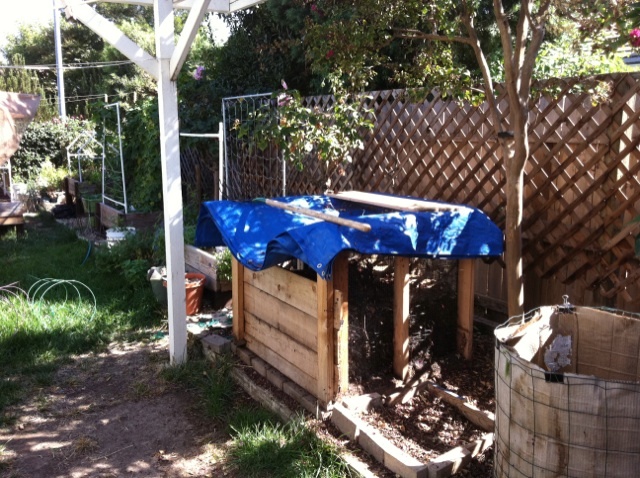 The color spot has been amended with bagged and homemade composts to give it water retentive organic material. It's on drips at two 10-min bursts twice a week = 40 minutes. The celosia are from volunteer seeds from the prior summer and they have strong deep roots. 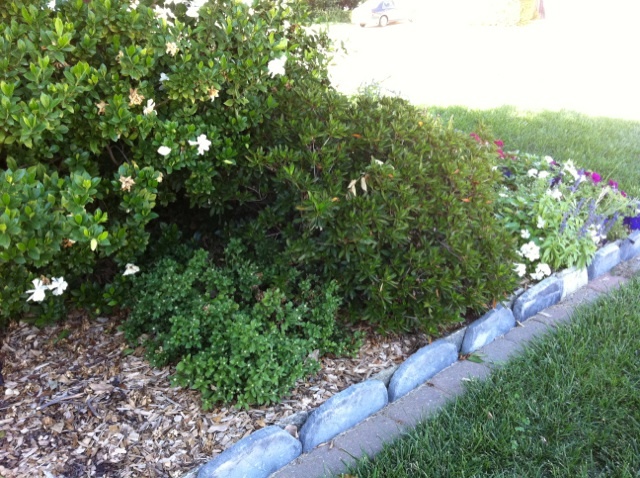 The flower bed up by the house is more Back to Eden with 2" of wood chips on top of bagged composts and peat moss and vermiculite. It's also on drips under the chips. I can't wait to see how it will transform this winter when we will get some rain. Especially if I can convince hubby to let me work in some horse manure under the chips. Audrey, again, you have put me to shame. If it's cool tomorrow I will be outside working. Wow, that is not a lot of water. This year we had an tremendous spring and as a result I am watering 6 hours a day, 5 days a week. That sounds like a lot and it is but we are running unfiltered ditchwater so the only sprinklers that work are those frog eye ones. We are trying to load the sub soil as much as we can for the winter as we won't be here. We hope for EL Nino and a wet fall, for you as well. John, Didn't you buy a unit in Arizona or NM? Snow bird? California is starting to cool off, which means I am venturing outside, finally. Pulled out the remaining flowers from the front color spot, added Ecoscraps Compost and homemade compost, and replanted with snapdragons, diathus and pansies for the winter. Also, bought some cabbage, rainbow chard, red onion and lettuce starts. I'll work on those tomorrow. The kales won't be in the local nursery until Friday. Thank goodness at least someone is on the job! Our best local nursery only provides kales either of a very limited variety as smallish plants or in a wider variety in 8-inch pots looking fully grown for a couple bucks each. Unless you just want to plant a border of decorative kale, they aren't of much use to me, kale-wise. She was MIA today when I cleaned out the 2 x 8 TT in preparation for kale, chard and bok choy. After wrestling the 6 tomatoes (and 6 peppers and some herbs) from the box, I am declaring that all tomatoes will go in 5 gal buckets. Masses of roots, some hung up to dry so I can salvage the MM. I will take some photos tomorrow of my feeble efforts to put in a winter garden. The peppers in the 2.5 x 4 are giants and really producing! We are taking off on Sunday on a wanderer's vacation, not going to NY this fall. We will drive around for 5-7 days. Up the No. Cal coast, maybe across So. OR (Marc), down and across NV to Utah. Down to Sedona AZ and back up CA to home. That's our general route. We'll just plan one day at a time. We had a nice tiny rain of 0.05". The sky was actually blue today. How are the rest of you? Some areas are supposed to get rain on Sunday. Would love to say hello if you come up our way! Thanks Marc. I'll let you know if we are headed to your area. Ok, wait a minute...I just caught up on this thread from back in mid Sept. We're winding down here in NE and it seems that you folks are just gearing up for the next round. So happy for the showers heading your way! The Cape is getting pounded, day 4, and it's already greening things up. Sanderson, you really need to give Cat some valium. Do you have any photos of your peppers? I'd love to see them as mine are always feeble at best. Also, what did you use to spray the compost tea on your lawn? It seems it might clog any spraying device unless filtered...? Audrey, nice planting job. Any photos? My very best bell peppers ever came from planting seeds from a tasty red bell pepper we bought at Costco. I had a couple squares open so I just scattered the seed to see what might grow. All the seed sprouted so I just thinned to one per square and we're enjoying the harvest right now. My dog decided to dig up two of the areas I planted last week. I'm going to strangle her one of these days, but she keeps looking up at me with those sweet "I'm pretending I'm an innocent bystander" eyes! So I grabbed a couple panels I usually use to trellis and I propped them up over the top of the gardens by 6-9 inches and that's stopped her. Everything is beginning to sprout and should really take off this week as the temps drop into the 70-80s. Keep dry you East Coasters... that storm is something! Audrey, Ouch, now both of you have bad backs! Was the tomato in the BTE row area? It was hard enough pulling from my MM TT. Good thing you already did your fall planting. 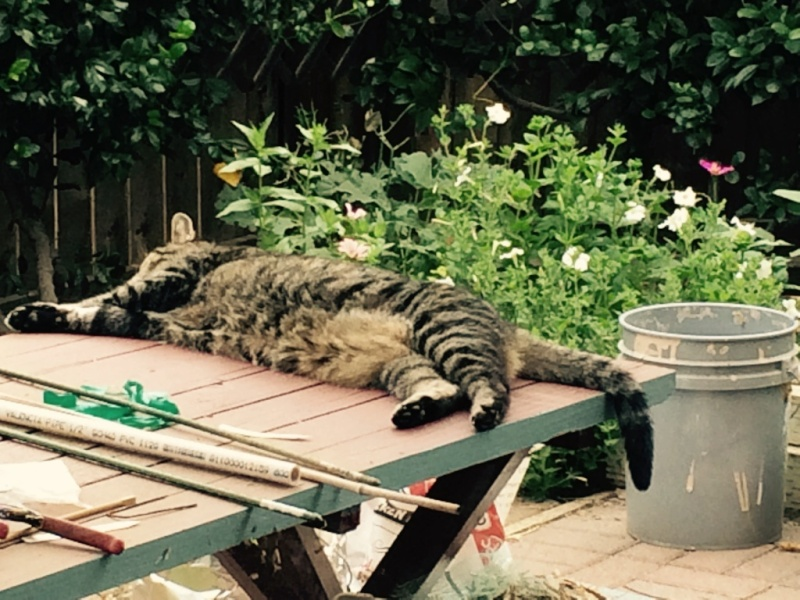 Got to just keep loving our darn pets, no matter what they do. I took some photo and will post them later today or tonight. Keep safe and dry, you eastern folks. The tomato was in a BTE bed and didn't have any flowers or fruit on it even though it had grown fairly large. I realized I wasn't going to get anything out of it before the first frost so got it into my head to just pull it. Boy do I wish I could rewind like on a TIVO! That minute has cost a week's pain, a bunch of chiro visits and work time. My tomatoes in my green house are looking really good. They grown well and are starting to put out flowers and fruit with a couple months yet to grow so I'll have toms all winter. LOVE that! This time I just took cuttings off of other tomatoes and they grew so much faster than the seedlings I planted at the same time. My newest 4x8s will be covered with plastic and will give me additional "greenhouse" space. I think I'll buy a couple more survival blankets to cover them in the coldest weather and see what I can grow there. I realized in another month or so I'll go from jungle to dead overnight :-( and my kitchen counters won't be overflowing with zucchini and tomatoes any more! Audrey, Next fall I hope to put up the little green house with a couple of tomato buckets, maybe some potted peppers. Your large green house and now the 4 x 8s sound so good for winter. CC, I took some photos Saturday, warts and all. Here are 4 pepper plants 3'+ tall and falling over the bed. 2 Jimmy Nardinos, 1 pimento and 1 paprika. 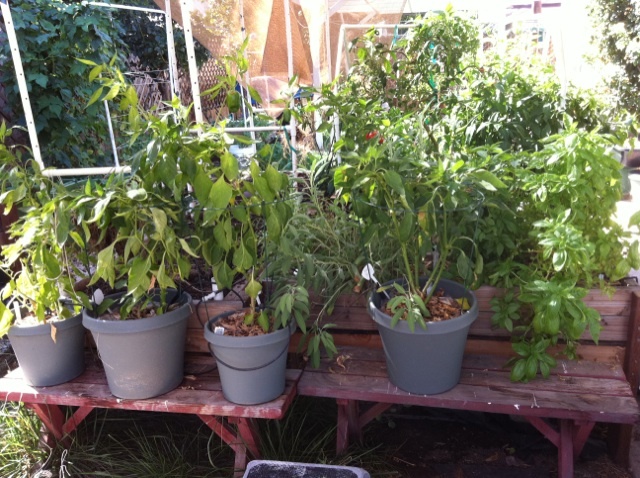 Bell peppers in pots with herbs in the 1 x 4' behind them. 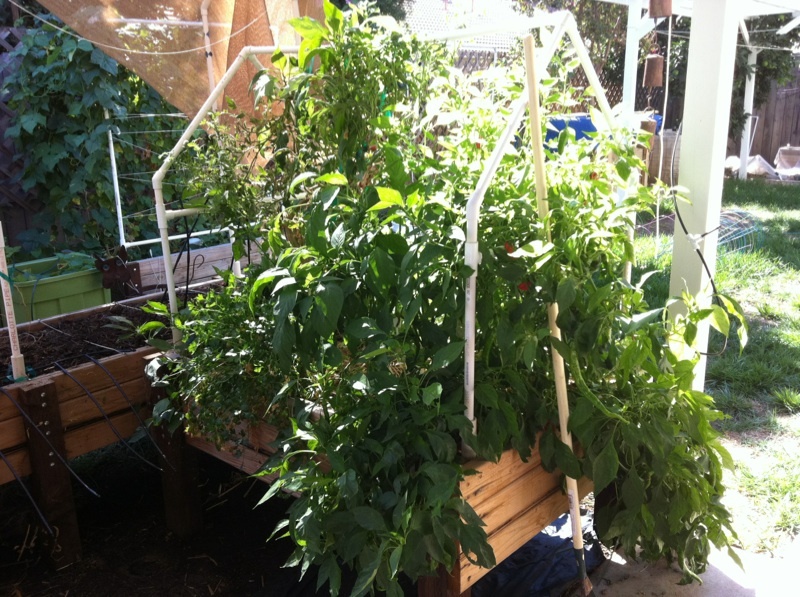 Next summer, the peppers are going in the 2 x 8 TT. Potted hot and bell peppers with the 3' x 3' flower spot in the background. 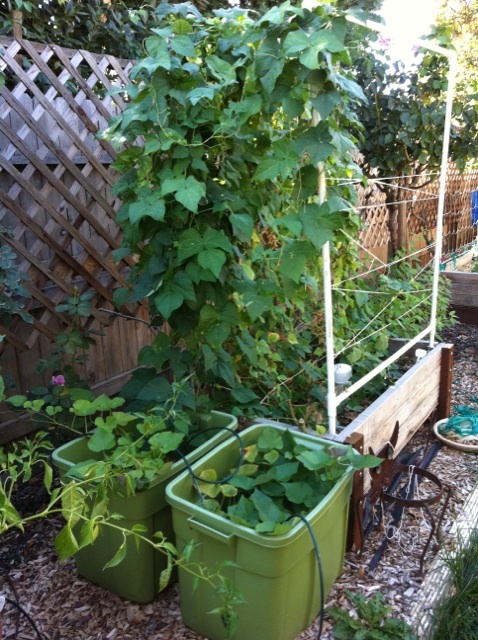 Kentucky Wonder beans and containers with sweet potatoes. The 2 x 3 TT bed ready for cabbages with a flat of veggies and flowers to be planted. Poblamos photo bombing. The south fence, looking from west to east (public sidewalk on the otherside of east fence). 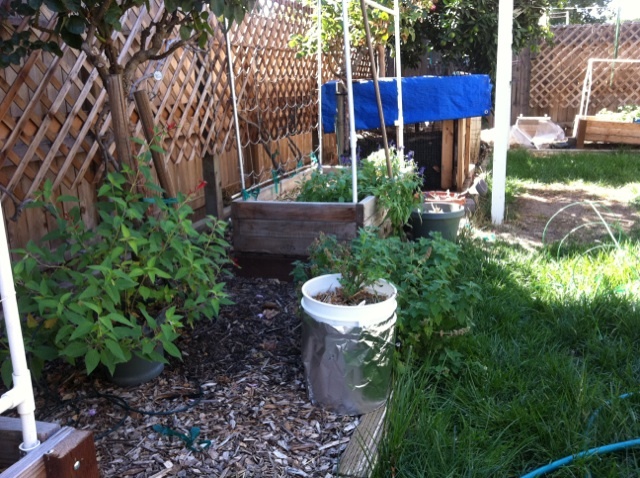 From right to left: the round junky compost bin for the flowers, Sweetie's bed of leaves as kitty litter for peeing, the wood compost bin for the veggies, tall rose plants, two 2 x 4 beds and the 2 x 3 bed. The bare areas in the lawn are from turning the compost on a tarp. Fescue does not take heavy abuse. South fence line, looking east to west. 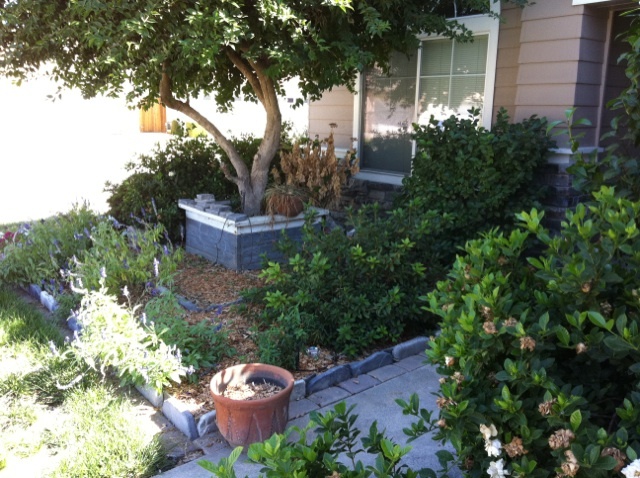 Overgrown lawn and flowering potted pineapple sage. 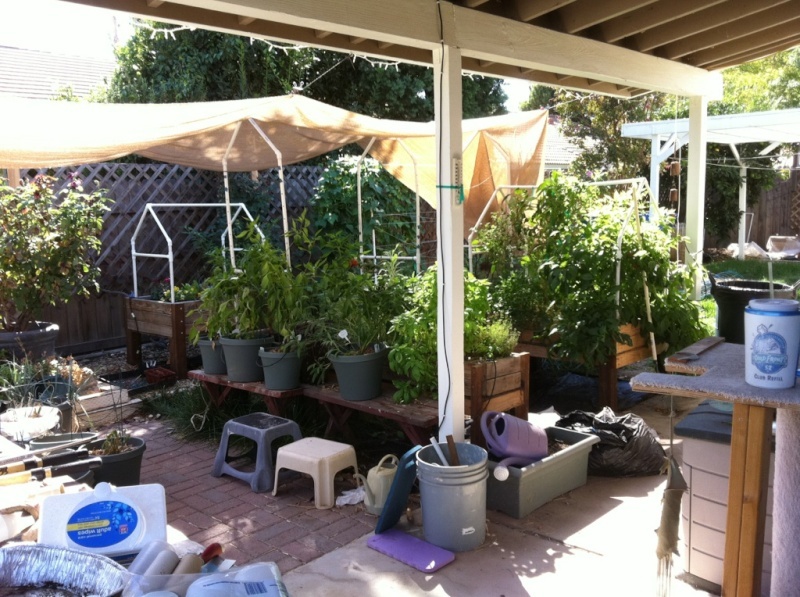 Lastly, a view from the back patio with all the beds, plants, giant ice tea, and mess. Front yard with some BTE areas. This is the color spot amended with more compost and chop 'n' drop, and planted for winter with snapdragons and dianthus. You can see the damage from the fungus to the lawn. I need to put some mulch to cover up the drip lines. 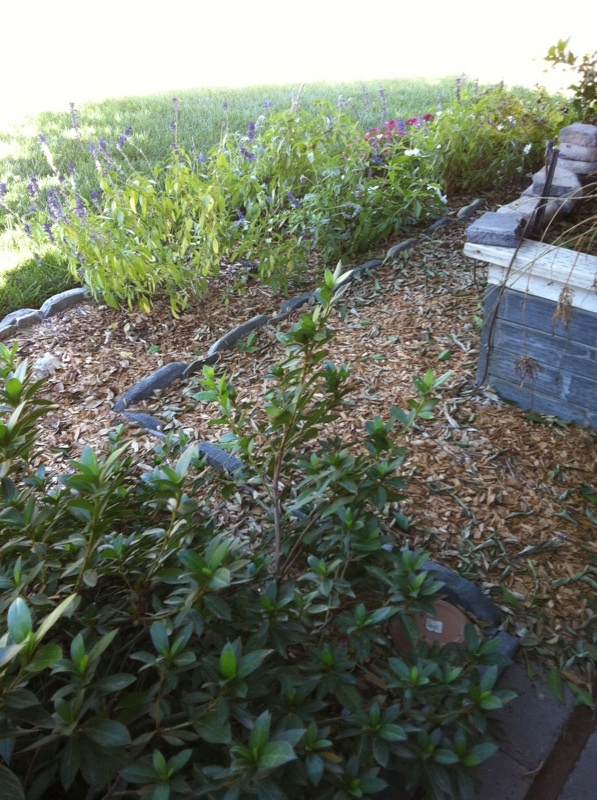 Front flower bed with wood chips. The flowers in the basket have been removed for replacement. 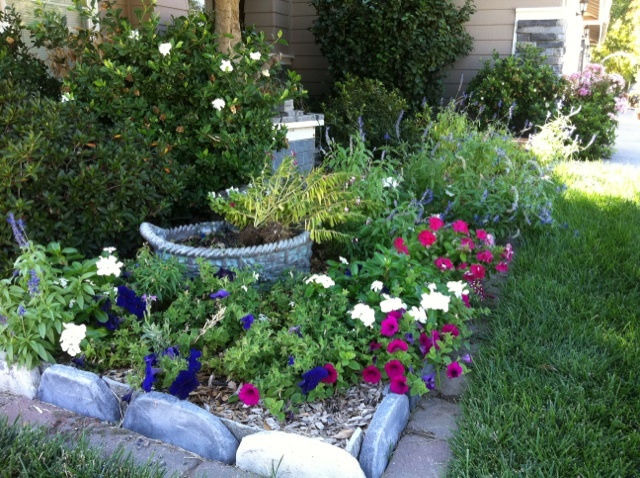 Other view of flower bed. The wood chip walk area around the xylosma tree. It's wide enough for the 6' ladder for pruning the tree. I've started removing some of the flowers in the flower bed section, getting ready for winter flowers. Mexican sage that the hummingbirds and bees love. 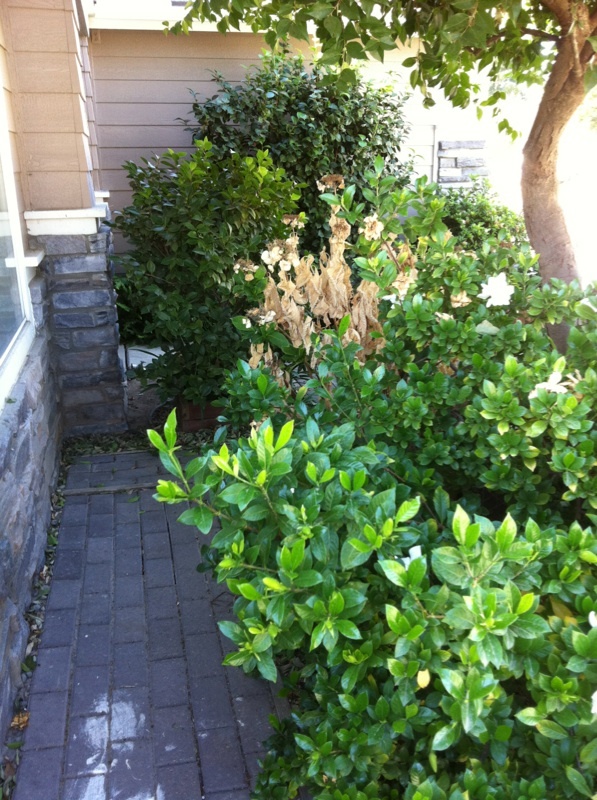 This area still needs to be summer-proofed. Maybe next spring. 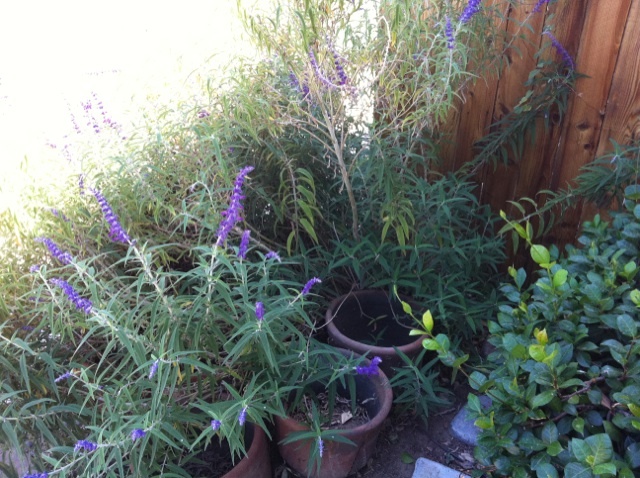 Mexican sage. The xylosma tree needs pruning, but now that I am sensitive to the bees, I have to wait until it finishes blooming before I take some of their last fall food source. The sand and brick walkway in front of the house. The dripper fell out of the hydrangea but it is still alive down in the center. 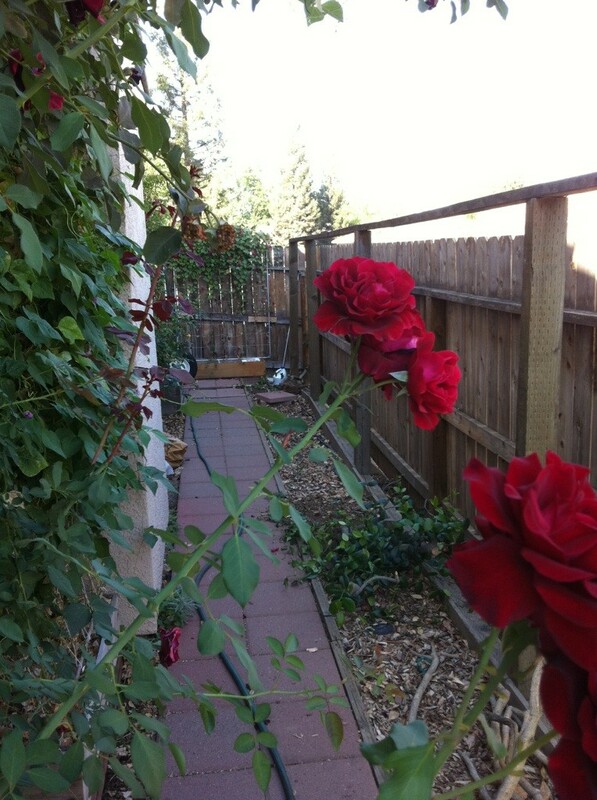 Side walk view of the Don Juan rose bush and the 2 bean/pea trellises. Rattlesnakes still producing in the right side box. 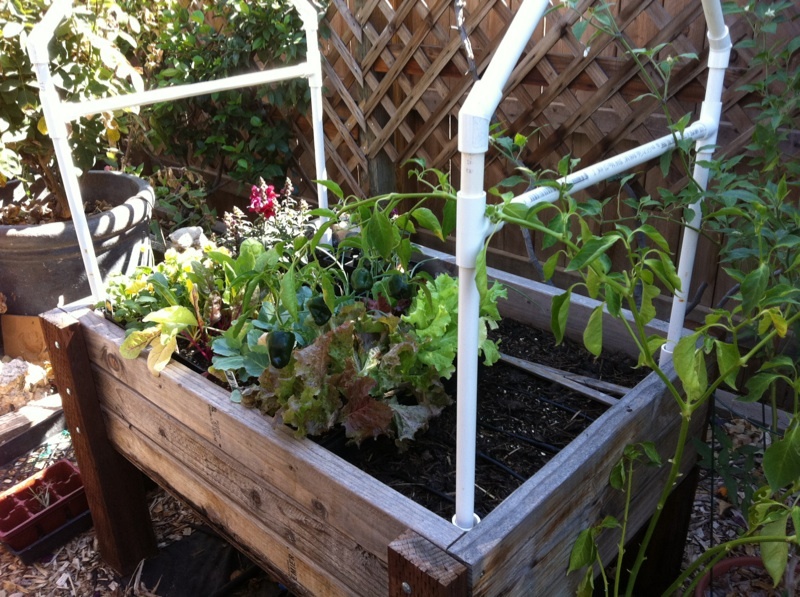 The left box was just planted with snow peas today. Have pole beans outside these windows helps cut down the bright morning sun in the kitchen. On the inside of the sidewalk is our major fall project. 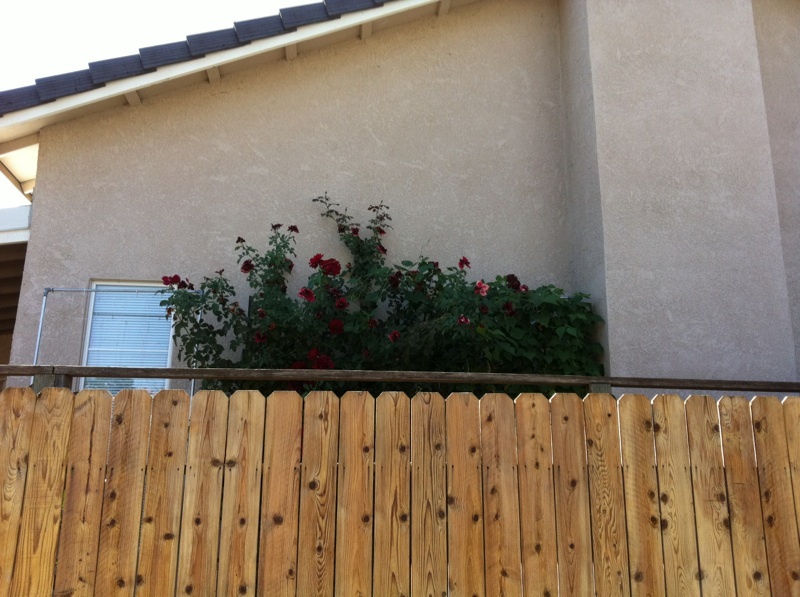 We have cut down and removed the mass of star jasmines and old redwood lattice work. After 20 years, we are tired of the work maintaining the nasty, dirty, sappy star jasmines. 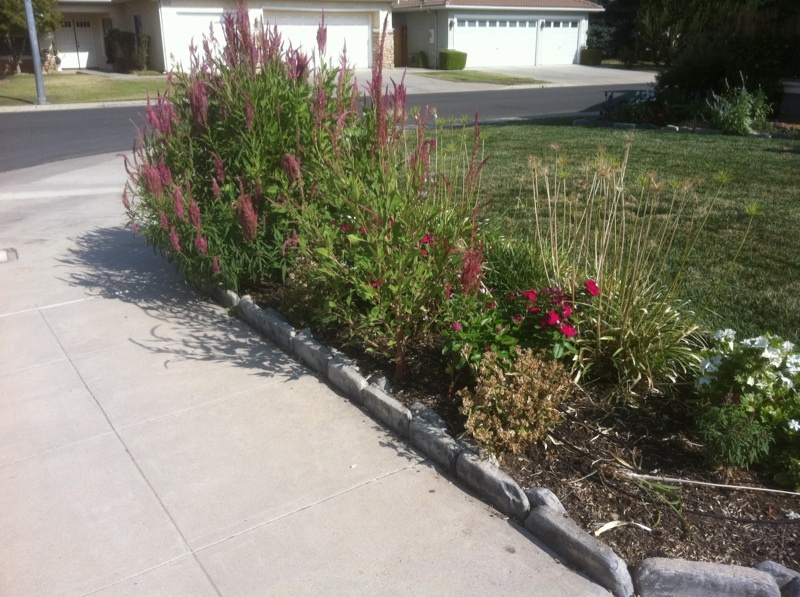 Fresno doesn't have rain to wash off plants. The posts will be lowered to outer fence height and new redwood lattice installed. The beds have been covered with the ramial chips from the Chinese pistachio we had removed this spring. Don Juan rose photobomb. Goodness gracious you have a lot going on there. Everything looks real nice. Holy crow! Beautiful, Sanderson! 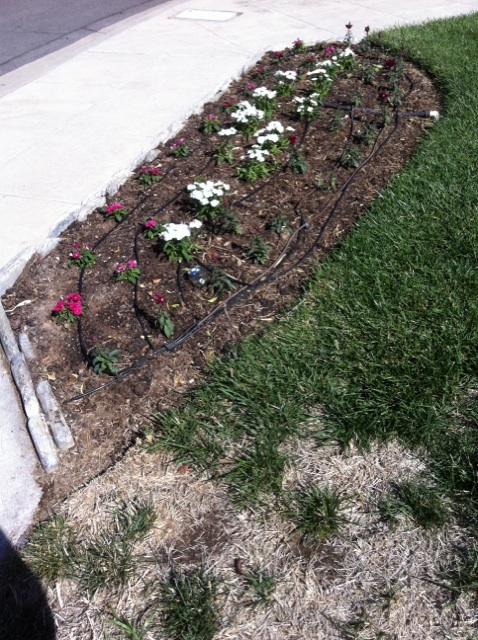 I have drip irrigation envy!!! Hey Yolos, I have 2 PM's in my outbox for you from back in August. Not sure what that means on your end but I wonder if you scroll back thru your PM's if there would be 2 from me that are still unread...? I'm not PM'ing this in case you aren't getting them from me. Thanks, folks. CC, I forgot to answer your question regarding spraying the grass. I use a spray jar with nozzle that attaches to the hose. I strain the tea through a wire mesh colander as I add it to the spray jar. That seems to be sufficient for the hose spray jar. If I was going to use any other type of sprayer, I think it would also have to be strained through a sheet in order to not clog up a nozzle.